Paulin Köpfer picks a vine leaf and shows us a patch of unnaturally bright green spreading through the leaf like an ink spot. It is the first sign of downy mildew on the Johanniter vines. Despite its good resistance to downy, the high temperatures, humidity of the Rhine valley and proximity to the thickly wooded Black Forest mean that disease pressure is often high. At a distance we hear the sound of a tractor working its way through the rows spraying a low dose of copper and sulphur to keep it at bay. We are on a tour of Zähringer biodynamic vineyards which are scattered in sloping parcels around the pretty village of Heitersheim, near Freiburg, and it is their plantings of the Johanniter grape that have attracted us. Johanniter is a hybrid of Riesling crossed with Pinot Gris and Gutedel (Chasselas), which was bred at the nearby Staatliches Weinbauinstitut Freiburg. At present, it is probably the closest one can hope to achieving the fruity, mineral-rich Riesling flavour in a UK vineyard. Paulin has 30 years’ experience in the Zähringer vineyards and is also the cellar manager, overseeing the production of their range of excellent biodynamic wines. His belief that the best wine can only come from the best grapes is clear – the maxim that good wine can only be made in the vineyard is evident throughout. He still finds it miraculous that the energy of the sun – with some CO2, a little water and a healthy soil – can produce juicy bunches of grapes which, in turn, re-release the CO2 during fermentation and pour the energy of the sun into the wine itself, completing a perfect cycle. For him, wine has the sanctity of a living thing. Paulin uses all the biodynamic preparations, but in different ways. Horn Manure (BD500) & and Horn Silica (BD501) are sprayed as usual onto the soil and vines respectively, while the compost preparations (BD502-507) are combined as Maria Thun’s Barrel Preparation and also sprayed onto the vineyard. He does not apply biodynamic compost directly to the already rich soil, preferring to use alternative rows of green manures. He says that is it is important to recognise when your soil has achieved balance and not to overload it with the excess nutrients from large volumes of compost. Equisetum tea (BD508) is used occasionally as a spray to help reduce mildew. The tour is followed by a look around the winery and cellars in the centre of the village, and a tasting. As the winery is closed for lunch, we have the cool courtyard to ourselves. Paulin first serves up a sparkling Johanniter called Zähringer Edelgraefler Winzersekt. It is delicious, tasting of zesty fruits with a hint of fresh-bread yeastiness. We express surprise as we’ve never heard of a sparkling Johanniter – Paulin smiles and asks us not to let on to his competitors. The still Johanniter is equally successful with a perfect balance of fruit and ripe acidity combined with the subtle mineral notes of Riesling. Paulin’s mobile rings. It is his wife calling him home for lunch. He drops us off at a traditional German restaurant, blazing with pelargoniums, where we excitedly discuss Johanniter over a schnitzel and a glass of Weissburgunder. It was the confirmation we wanted that we should seriously consider Johanniter in our next planting at Limeburn Hill Vineyard. Roy Cook grows it at Sedlescombe but notes that he sometimes has trouble ripening it, while Sarah Bell at Sunnybank Vine nursery has had good results with the ripening. 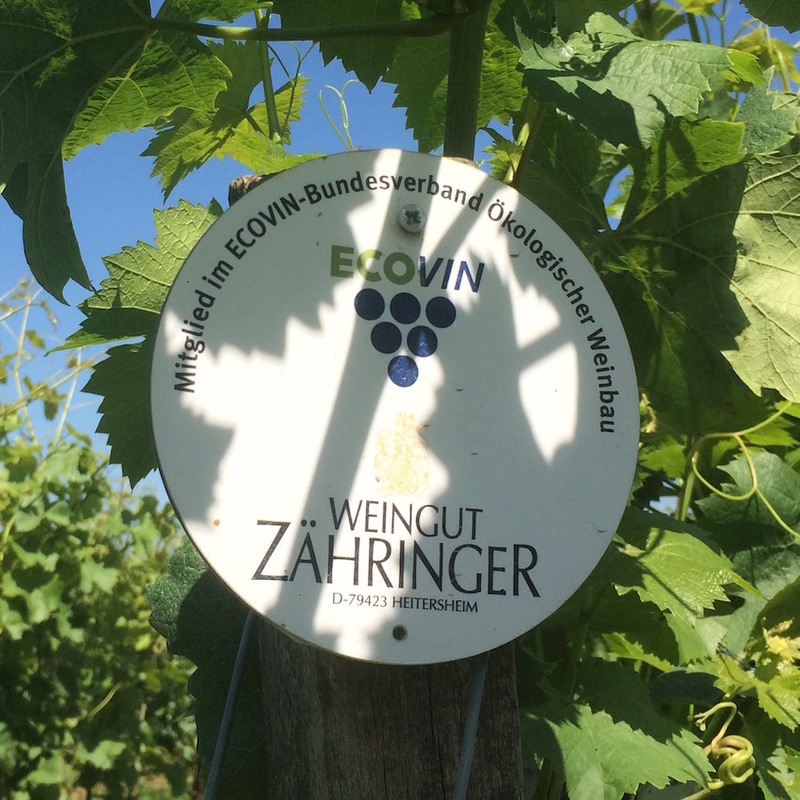 With sincere thanks to Paulin, our visit to Zähringer has demonstrated the possibility of making a Riesling-like still wine in the UK, with a sparkling option if this late-ripening variety struggles with our climate.